The Alt Right is dead. But the Alt Right was so useful—and so much fun—that we need to create a replacement for it, the sooner the better. By the Alt Right, I mean the online movement of White Nationalist podcasters, bloggers, and social media trolls that emerged in 2014, coalesced around the Trump candidacy in 2015, then began to change the parameters of political debate with stinging memes like the “cuckservative” barb, becoming an international media phenomenon in 2016. As I argue in my essay “What is the Alternative Right?” (Part 1 , Part 2 , Part 3 , Part 4 ) this new Alt Right was quite different from the original Alt Right that took its name from the Alternative Right webzine which Richard Spencer founded in 2010 and edited until 2012. The two Alt Rights differed in terms of ethos, intellectual influences, and preferred platforms and media, although they did come to share an ideology and a name. By the beginning of 2015, the new Alt Right was increasingly comfortable with White Nationalism as an ideology and the Alt Right as a brand. Aside from the fact that #AltRight made a good hashtag, the main utility of the term was its vagueness. It allowed people to signal their dissent from mainstream Republicanism without embracing such stigmatized labels as National Socialism and White Nationalism. The Alt Right was thus an ideal “discursive space” in which White Nationalists could interact with, influence, and convert people who were closer to the political mainstream. White Nationalists should always remember how we came to our views. We should never lose sight of the fact that it takes an inner struggle, ended by an act of courage, to seriously consider heretical and highly stigmatized ideas, even online, in the privacy of one’s own home. Thus we need safe spaces for trying on new ideas and building new relationships. The Alt Right provided that. It allowed people to experiment with being radical and edgy without being one of “those people” or burning one’s bridges to the mainstream. The result was a grassroots online insurgency mobilizing a vast network of highly creative individuals and injecting their memes and talking points into the mainstream, where they began shifting popular consciousness and political debates. But, as I also argued in “What Is the Alternative Right?” (Part 2 ), the Alt Right’s success in attracting people led to a crisis. Both versions of the Alt Right were always, at core, White Nationalist outreach projects. But there was a perennial battle in the Alt Right between the people who advocated a “big tent” movement and the “purity spiralers” and Right-wing sectarians who wanted to enforce one ideological orthodoxy or another. I was in the big tent camp. I argued that outreach projects by their nature attract people who do not (yet) agree with us. But you can only convert people who don’t already agree with you. The whole point of the movement was to convert rather than repel people who disagreed with us. But the new Alt Right was such a successful outreach project that it was being flooded with large numbers of Trumpian civic nationalists, including non-whites, who rejected White Nationalism. I thought this was a good problem to have, and that we needed to take a deep breath, remind ourselves that truth is on our side, and then get back to the battle of ideas. Others, however, became concerned that the Alt Right brand would be hijacked or coopted by civic nationalists like Milo Yiannopoulos. This was the Alt Right “brand war” of the fall of 2016. The brand war came to an end with the Hailgate incident of November 21, 2016, when, before the cameras of the enemy media, Richard Spencer raised his glass with the words “Hail Trump, Hail our People, Hail Victory!” and people in the audience responded with Nazi salutes. This stunt indelibly identified the Alt Right not just with White Nationalism but with neo-Nazism in the minds of the whole world. This led to a split between White Nationalists and civic nationalists, who came to be called the Alt Lite. To differentiate itself from the Alt Right, the Alt Lite dug in its heels on the one issue that White Nationalists most urgently need to destroy: the moral taboo against white identity politics. The great big beautiful tent, where civic nationalism and ethnonationalism could be debated—an argument that White Nationalists always win—was replaced by a great big ugly wall, over which only venomous tweet barrages were exchanged. The expanding discursive space in which White Nationalists could influence the mainstream was replaced by a self-marginalizing political sect which in 2017 began to focus on street activism, even though they were vastly outnumbered and outgunned by the Left, which could count on collaborators in the media and all levels of government, as well as armies of lawyers and effectively unlimited funds. White Nationalists have none of these advantages. Thus, a movement that had grown by attacking the system’s moral and intellectual weaknesses from a position of strength was replaced by a movement that attacked the system’s institutional power centers from a position of weakness. Catastrophic failure was inevitable. By the end of 2017, much of the American White Nationalist movement was simply exhausted from the wave of doxings, deplatforming, and lawfare that followed the Unite the Right rally in Charlottesville, Virginia, on August 12, 2017. In the days following Unite the Right, more than one hundred people disappeared from my social media sphere alone. They obviously did not change their political convictions, but they clearly believed that the movement was going in the wrong direction. Nevertheless, the rallies and college speaking events continued, hemorrhaging people and money—which were in short supply to begin with—until they finally bled out. But for many in the American movement, 2018 has simply been a year of watching and waiting. People hunkered down to let the storm pass. Now that it is dying down, they are surveying the damage and wondering what comes next. Wouldn’t it be nice to have a common cause to rally around again? Wouldn’t it be nice to have a new discursive space in which we could again interface with and perhaps influence the political mainstream? Some people are hoping that Trump’s re-election campaign might provide a rallying point, but most of us have lost our enthusiasm for Trump. Thankfully, there’s something bigger and better than Trump. While there will always be a place for defending Trump’s National Populist policies from critics and detractors, we can’t lose sight of the big picture. We need to look beyond Trump to the forces that made Trump possible. 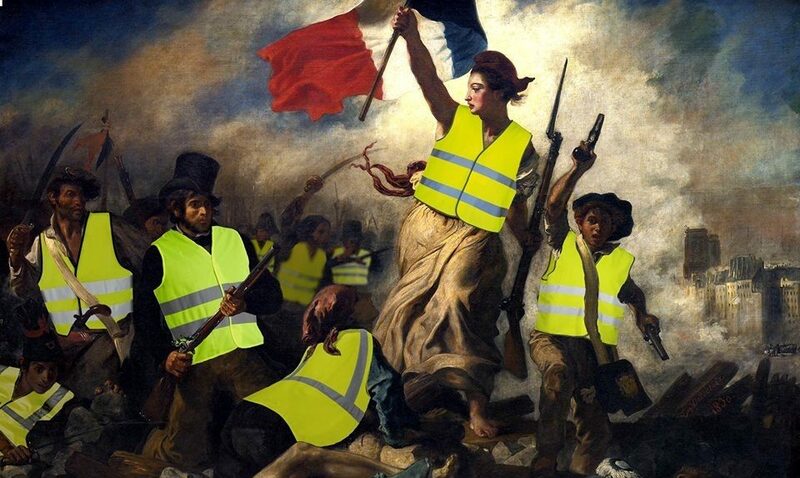 These are the same forces behind the Brexit victory; behind the rise of politicians like Viktor Orbán, Matteo Salvini, and Sebastian Kurz; behind the success of parties like Alternative for Germany, Poland’s Law and Justice, and the Sweden Democrats; and behind the Yellow Vests insurgency in France. All of these are manifestations of what is called National Populism or the New Nationalism. We need to understand the forces driving the rise of the New Nationalism. Then we need to add our impetus to these forces and try to steer them toward White Nationalism. The New Nationalism should be our new rallying point, our new discursive space in which we can inject our ideas into mainstream discussions. For starters, I urge every White Nationalist to read National Populism: The Revolt Against Liberal Democracy by Roger Eatwell and Matthew Goodwin,  two British political scientists specializing in populism and political extremism. Eatwell and Goodwin are evidently men of the Left, but they do not seem to be liberals or globalists. Indeed, they relish demolishing liberal and globalist illusions about National Populism, arguing that it cannot be dismissed as mere fascism or racism; nor can it be dismissed as simply a flash in the pan, the product of ephemeral events like the 2008 recession or the migrant crisis; nor is it the last hurrah of “old white males” who will soon die off and be replaced by tolerant millennials; nor, finally, is it merely the product of charismatic politicians. Instead, Eatwell and Goodwin argue that National Populism is the product of deep social and political trends which they call the four Ds: Distrust, Destruction, Deprivation, and De-Alignment. Distrust refers to the breakdown of popular trust in political elites. Destruction primarily means destruction of identity, i.e., the destruction of peoples and cultures by immigration and multiculturalism. National Populism is, therefore, a form of white identity politics. Deprivation means the erosion of First World middle-class and working-class living standards due to globalization and neoliberalism. De-Alignment is the breakdown of voter identification with dominant political parties. Eatwell and Goodwin marshal impressive empirical studies that indicate that these trends are pervasive in white countries. These trends are deep-seated rather than ephemeral. Not only are they going to continue on into the future, they are likely to grow stronger before they abate. Thus, National Populism is here to stay. National Populism is the wave of the future, not just a ripple in the news cycle, hence the great wave on the cover of their book. Eatwell and Goodwin are so confident of this that in their final chapter, “Towards Post-Populism,” the only post-populist scenario they can imagine is the political establishment adopting National Populist policies. In other words, they think National Populism will likely become the hegemonic political outlook. This is an astonishing concession, since it means that the hegemony of globalism is drawing to a close. I find this analysis deeply encouraging, and it puts to rest a fear that has been gnawing at me for the last two years. I believe that nothing less than White Nationalism can save our race, thus the success of our movement is the supreme moral imperative. Whites are in a state of emergency. This is serious. This is urgent. Thus in 2015 and 2016, I was thrilled to see forces in the broader political realm aligning with White Nationalist ideas and goals, specifically Brexit and the Trump phenomenon. But I also thought it likely that this historical moment would be fleeting. Thus we had to capitalize on it while it was still possible. This is why I was so horrified at Hailgate, when instead of giving a statesmanlike speech outlining how the National Policy Institute would serve as the intellectual vanguard for National Populism—a move that would have secured Spencer’s bid for movement leadership and attracted significant resources—he instead chose the path of juvenile buffoonery, hoping to ingratiate himself with the cool kids at TRS and on the chans. But that was just the beginning of months of sectarianism, schisms, purges, and purity spirals. In 2017, we saw the birth of toxic, self-marginalizing memes like “white Sharia” and the return of the worst ideas and attitudes of White Nationalism 1.0. We had arrived at a moment of decision, and our “leaders” had chosen juvenility and irrelevance. They were not ready for prime time. As I explained in my essay “Against Right-Wing Sectarianism ,” this could only lead to a smaller, weaker, poorer, and dumber movement. Such a movement would be unable to halt white genocide. By May of 2017, I started thinking that we needed a new “brand.” The term “New Nationalism” was already being used to describe National Populism. The term was broad and vague enough to encompass everyone from White Nationalists to sitting presidents and ruling parties. I even went so far as to reserve the domain name newnationalism.net. In keeping with my essay “Redefining the Mainstream ,” I envisioned a discursive space that was the exact opposite of Right-wing sectarianism. Our movement must prefigure the hegemony we want to create in the broader society, encompassing the full diversity of whites, united only by the central principle of white identity politics and free to differ on all other matters. The most important intellectual battle is over the legitimacy of white identity politics. The greatest political taboo of our times is the idea that identity politics is immoral for white people—and only for white people. This taboo unites the whole political establishment against us. The political establishment knows this, but many National Populists don’t. This is why the establishment attacks National Populists as fascists, nativists, and racists. But many National Populists don’t challenge the idea that white identity politics is immoral. Instead, they insist that they are color-blind civic nationalists, concerned only with a common culture. Then they try to turn the tables on Leftism and accusing it of being the real identity politics. But, of course, the Left is not going to drop identity politics. Why would they drop a winning strategy? Foreswearing identity politics is a losing strategy for the Right, akin to unilateral disarmament, taking a knife to a gunfight, or allowing one’s opponents a trump card but refusing to use it oneself. Thus, the New Nationalism platform needed to be a space where one could argue about virtually anything except the moral legitimacy of white identity politics. Instead, our overriding editorial agenda would be to establish that white identity politics is inevitable, necessary, and moral —and to expose the moral illegitimacy of the system. I shared this idea with a number of writers, podcasters, and video bloggers who also believed the Alt Right was spiraling into irrelevance. They were uniformly enthusiastic. But there were things I had to take care of first, like finishing The White Nationalist Manifesto . I also sensed that it would be some time before the Alt Right would finally exhaust itself and people would be ready for something new. Eventually, though, I decided that I want to stick with Counter-Currents. I still think that a New Nationalism webzine is a good idea. But somebody else needs to create it. So, how can White Nationalists insert ourselves into the broader National Populist phenomenon? Let’s look at Eatwell and Goodwin’s four Ds again. Distrust: when people distrust their rulers, the system loses legitimacy and power. White Nationalists are masterful at mocking the lies, hypocrisy, sanctimony, cowardice, and degeneracy of our rulers. Furthermore, nothing destroys trust in the establishment quite like learning that its ultimate agenda is the genocide of the white race. But our propaganda needs to be truthful as well, because we want people to trust us. For if distrust becomes pervasive throughout society, then the people cannot unite against the establishment. Our goal is to promote a high-trust society. We cannot accomplish that if we cynically resort to lies because “that’s what the establishment does to us.” If we want to replace the establishment, we have to be better than the establishment. Destruction: White Nationalists have been raising awareness of the destruction of white nations and cultures through immigration and multiculturalism for decades. Even so, our educational efforts have awakened far fewer people than the negative consequences of immigration and multiculturalism themselves. The system is doing far more to push people toward white identity politics than we are doing to pull them. Thus, white racial consciousness will continue to rise even if our movement is completely censored. We should, of course, do everything we can to raise awareness. But I think we have a much more important role to play, namely deepening awareness. First, we need to help people understand why multiculturalism is a failure—namely, racial and ethnic diversity in the same state is always a source of weakness —so we don’t waste our time with half-measures like “conservative” multicultural civic nationalism. Moreover, only White Nationalists fully understand the forces promoting mass migrations and multiculturalism and how they fit into the overall agenda of white genocide. Second, and most importantly, we need to defend the moral legitimacy of white identity politics. Vast numbers of whites are in thrall to the establishment because they believe there is something immoral about taking their own side in ethnic conflicts. This taboo is like a dam, holding back the floodwaters of National Populism. Once we break that dam, the wave of National Populism will sweep away the whole rotten system. Deprivation: basic economics predicts that globalization will lead to the collapse of middle-class and working-class living standards throughout the First World, although First World elites will benefit quite a lot. Obviously, the masses in any First World society never consented to such policies. Genuine Leftists recognize that globalization has undermined the gains of the Left in the First World. But global socialism is not the answer to global capitalism. Only National Populists understand the natural limit of globalization: the nation-state . De-Alignment: when voters begin to distrust the establishment, they begin to distrust establishment political parties as well. White Nationalists are masterful at showing that electoral politics, in which voters take sides in the battles between mainstream political parties, is only a superficial distraction from real politics. Political power does not lie in voters choosing between Coke and Diet Coke. That’s an election that the Coca-Cola Corporation can’t lose. Real power lies in framing all political debates so that, no matter which party ends up in power, the establishment always wins. Real power lies in establishing the things about which political parties agree rather than fight and about which the voters are never given a choice. The political establishment, center-Left and center-Right, is of one mind on the goodness of globalization, immigration, and multiculturalism—the very things that National Populists oppose. What white people want is essentially a socially conservative, interventionist state. We want National Populism. What the establishment wants is socially liberal global capitalism, what Jonathan Bowden called Left-wing oligarchy. The people are never allowed to vote for National Populism straight up. The center-Right packages social conservatism with neoliberal globalization. The center-Left packages the interventionist state with social degeneracy. When the center-Right is in power, they only give the establishment what it wants: lower taxes and freer trade for the oligarchs. When the center-Left is in power, they only give the establishment what it wants: more degeneracy. The parties blame their failures on the opposition and assure their voters that the next time their party is at the helm, the voters will finally get what they want. The people are placated with the illusion of political representation in elections where the establishment parties trade power. But no matter who is elected, the outcomes always drift father and farther from what the people want, namely National Populism—and closer to what the degenerate global elites want. White Nationalists are also highly aware of how the establishment works to co-opt National Populist uprisings like the Tea Party and now, sadly, Donald Trump. For Trump has fallen into the center-Right establishment pattern of giving the oligarchs what they want (tax cuts), failing to do what the people want (a border wall), and blaming his failure on his opponents (first the establishment Republicans, now the Democrats). In sum, White Nationalists can intensify National Populist forces and steer them toward White Nationalism by deepening the people’s Distrust of the establishment; broadening and deepening the people’s awareness of how and why globalization, immigration, and multiculturalism are leading them to Destruction and Deprivation; and creating new political possibilities by encouraging De-Alignment with the establishment’s sham political debates and contests. But to ride the National Populist wave, White Nationalists have to jettison certain incompatible ideological fixations. First and foremost, we actually have to be populists. Eatwell and Goodwin also show that National Populism is not anti-democratic. National Populists want more democracy, not less. They also argue that National Populism is not fascist in its inspirations or goals, although the establishment loves nothing more than to stigmatize National Populism with such labels. We shouldn’t help them. Thus those among us who sneer at populism and democracy , make fetishes out of elitism and hierarchy , and try to resurrect inter-war fascist movements  are not helping. Second, National Populists really are economic interventionists. Old habits die hard, but those among us who still think in terms of “free market” economics are not helping. Eatwell and Goodwin point out that in the United States, Republican voters are significantly more interventionist than Republican legislators. Which means that Koch-funded free-market fundamentalism has simply produced a party headed by ideologues who are out of touch with their constituency. Don’t be one of them. Where do we go from here? The most important thing to keep in mind is that National Populism is arising out of the breakdown of the political system. Just like shattering an atom, the breakdown of a system releases immense energies. It also creates radical new possibilities, “holes in being” where new actions can take place and new orders can emerge. But the breakdown of systems also creates uncertainty and surprises. It is not an environment in which one can expect to unfold grand plans. Thus, the more our movement is tied to long-term plans and fixed ideas, the less adapted we are to the climate we wish to create, and the more brittle and susceptible to catastrophic failure we become. Accordingly, at the present moment, the best overall strategy is not to get ahead of ourselves. We simply need to promote chaos, but also plant the seeds of a new order. Then we need to wait. The Yellow Vests insurgency  is a genuine grassroots National Populist movement. But it was nobody’s grand design. It emerged spontaneously, and it surprised everyone. But spontaneous movements of large numbers of people are only possible because the participants share common views and values. Such movements also propagate through existing social networks. Thus, if we want more National Populist insurgencies, we need to promote chaos in the system, seed people’s minds with models of genuine National Populist alternatives, and build real-world social networks through which we can propagate ideas and influence. Beyond that, we simply need to adopt an attitude of maximum openness and flexibility in the face of new possibilities so we can react with fresh provocations. In short, we need more New Right metapolitics. But this is second-nature to us. We’ve been doing it for years now. We have the best ideas, the best memes, and the best people. But we need a new focus. If Eatwell and Goodwin are right, though, we now know that we have a vast audience, strong historical winds at our back, and time enough to turn the world around. Let’s make 2019 the year of the New Nationalism. Roger Eatwell & Matthew Goodwin, National Populism: The Revolt Against Liberal Democracy (New York: Pelican, 2018).